This article is about the device. For the competitive gymnastic sport, see Trampolining. For other uses, see Trampoline (disambiguation). A trampoline is a device consisting of a piece of taut, strong fabric stretched between a steel frame using many coiled springs. People bounce on trampolines for recreational and competitive purposes. 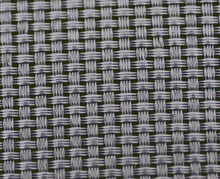 The fabric that users bounce on (commonly known as the "bounce mat" or "trampoline bed") is not elastic itself; the elasticity is provided by the springs that connect it to the frame, which store potential energy. A game similar to trampolining was developed by the Inuit, who would toss blanket dancers into the air on a walrus skin one at a time (see Nalukataq) during a spring celebration of whale harvest. There is also some evidence of people in Europe having been tossed into the air by a number of people holding a blanket. Mak in the Wakefield Second Shepherds' Play and Sancho Panza in Don Quixote are both subjected to blanketing – however, these are clearly non-voluntary, non-recreational instances of quasi-judicial, mob-administered punishment. The trampoline-like life nets once used by firefighters to catch people jumping out of burning buildings were invented in 1887. The 19th-century poster for Pablo Fanque's Circus Royal refers to performance on trampoline. The device is thought to have been more like a springboard than the fabric-and-coiled-springs apparatus presently in use. These may not be the true antecedents of the modern sport of trampolining, but indicate that the concept of bouncing off a fabric surface has been around for some time. In the early years of the 20th century, some acrobats used a "bouncing bed" on the stage to amuse audiences. The bouncing bed was a form of small trampoline covered by bedclothes, on which acrobats performed mostly comedy routines. According to circus folklore, the trampoline was supposedly first developed by an artiste named du Trampolin, who saw the possibility of using the trapeze safety net as a form of propulsion and landing device and experimented with different systems of suspension, eventually reducing the net to a practical size for separate performance. While trampoline-like devices were used for shows and in the circus, the story of du Trampolin is almost certainly apocryphal. No documentary evidence has been found to support it. William Daly Paley of Thomas A. Edison, Inc. filmed blanket tossing initiation of a new recruit in Company F, 1st Ohio Volunteers in 1898. 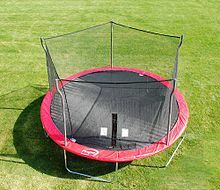 The first modern trampoline was built by George Nissen and Larry Griswold in 1936. Nissen was a gymnastics and diving competitor and Griswold was a tumbler on the gymnastics team, both at the University of Iowa, United States. They had observed trapeze artists using a tight net to add entertainment value to their performance and experimented by stretching a piece of canvas, in which they had inserted grommets along each side, to an angle iron frame by means of coiled springs. It was initially used to train tumblers but soon became popular in its own right. Nissen explained that the name came from the Spanish trampolín, meaning a diving board. Nissen had heard the word on a demonstration tour in Mexico in the late 1930s and decided to use an anglicized form as the trademark for the apparatus. In 1942, Griswold and Nissen created the Griswold-Nissen Trampoline & Tumbling Company, and began making trampolines commercially in Cedar Rapids, Iowa. Early in their development Nissen anticipated trampolines being used in a number of recreational areas, including those involving more than one participant on the same trampoline. One such game was Spaceball—a game of two teams of two on a single trampoline with specially constructed end "walls" and a middle "wall" through which a ball could be propelled to hit a target on the other side's end wall. During World War II, the United States Navy Flight School developed the use of the trampoline in its training of pilots and navigators, giving them concentrated practice in spatial orientation that had not been possible before. After the war, the development of the space flight programme again brought the trampoline into use to help train both American and Soviet astronauts, giving them experience of variable body positions in flight. The first Trampoline World Championships were organised by Ted Blake of Nissen, and held in London in 1964. The first World Champions were both American, Dan Millman and Judy Wills Cline. Cline went on to dominate and become the most highly decorated trampoline champion of all time. One of the earliest pioneers of trampoline as a competitive sport was Jeff Hennessy, a coach at the University of Louisiana at Lafayette. Hennessy also coached the United States trampoline team, producing more world champions than any other person. Among his world champions was his daughter, Leigh Hennessy. Both Jeff and Leigh Hennessy are in the USA Gymnastics Hall of Fame. The competitive gymnastic sport of trampolining has been part of the Olympic Games since 2000. On a modern competitive trampoline, a skilled athlete can bounce to a height of up to 10 metres (33 ft), performing multiple somersaults and twists. Trampolines also feature in the competitive sport of Slamball, a variant of basketball, and Bossaball, a variant of volleyball. There are a number of other sports that use trampolines to help develop and hone acrobatic skills in training before they are used in the actual sporting venue. Examples can be found in diving, gymnastics, and freestyle skiing. One main advantage of trampolining as a training tool for other acrobatic sports is that it allows repetitive drill practice for acrobatic experience every two seconds or less, compared with many minutes with sports that involve hills, ramps or high platforms. In some situations it can also be safer compared to landings on the ground. The frame of a competitive trampoline is made of steel and can be made to fold up for transportation to competition venues. The trampoline bed is rectangular 4.28 by 2.14 metres (14 ft 1 in × 7 ft 0 in) in size fitted into the 5.05 by 2.91 metres (17 ft × 10 ft) frame  with around 110 steel springs (the actual number may vary by manufacturer). The bed is made of a strong fabric, although this is not itself elastic; the elasticity is provided only by the springs. The fabric can be woven from webbing, which is the most commonly used material. However, in the 2007 World Championships held in Quebec City, a Ross bed (or two-string bed), woven from individual thin strings, was used. This type of bed gives a little extra height to the rebound. Recreational trampolines for home use are less sturdily constructed than competitive ones and their springs are weaker. They may be of various shapes, though most are circular, octagonal or rectangular. The fabric is usually a waterproof canvas or woven polypropylene material. As with competitive trampolines, recreational trampolines are usually made using coiled steel springs to provide the rebounding force, but spring-free trampolines also exist. In 1959 and 1960 it became very popular to have outdoor commercial "jump centres" or "trampoline parks" in many places in North America where people could enjoy recreational trampolining. However, these tended to have a high accident rate, and the public's interest rapidly waned. In the early 21st century, indoor commercial trampoline parks have made a comeback, with a number of franchises operating across the United States and Canada. ABC News has reported that in 2014 there were at least 345 trampoline parks operating in the United States. Similar parks have more recently been opened in other countries. The International Association of Trampoline Parks (IATP) estimated that park numbers had grown from 35-40 parks in 2011 to around 280 in 2014. The following year, IATP estimated that 345 parks were open by the end of 2014, and that another 115 would open by the end of 2015 in North America. IATP also estimated that at the end of 2014 there were 40 parks outside of North America, and that by the end of 2015 there would be at least 100 indoor trampoline parks open internationally. As of March 2019, CircusTrix (and its subsidiary Sky Zone) is the largest operator of trampoline parks in the U.S. and in the world, with 319 parks operating under their brands. These commercial parks are located indoors, and have wall-to wall-trampolines to prevent people falling off the trampolines on to hard surfaces. Padded or spring walls protect people from impact injuries. Despite these precautions, there has been at least one death recorded due to a head-first landing at a trampoline park. In March 2012, New York Yankees pitcher Joba Chamberlain seriously injured his ankle while jumping at a commercial jump centre in Tampa with his son. In 2018, a man died in a British Columbia trampoline park, which prompted calls for more safety regulations for these popular activities. Wall running is a sport where the participant uses a wall and platforms placed next to the trampoline bed to do tricks. The basic movement is a backdrop on the trampoline and then the feet touching the wall at the top of the bounce. From there, there is no limit to the acrobatic movements that are possible, similar to regular trampolining. The advantage is that twists and turns can be initiated more forcefully from a solid wall and that the vertical speed can be transferred to rotation in addition to forces from the legs or arms. Additionally, energy can be gained both from the bed at the bottom of the bounce, and from the wall at the top of the bounce. With safety nets, the risk of falling off the trampoline is reduced. Using a trampoline can be dangerous. Organized clubs and gyms usually have large safety end-decks with foam pads at each end, and spotters are placed alongside the trampoline to try to break the fall of any athlete who loses control and falls. In 1999, the U.S. Consumer Product Safety Commission estimated there were 100,000 hospital emergency room visits for trampoline injuries. Due to the much larger numbers involved and lesser safety standards, the majority of injuries occur on privately owned home trampolines or in commercial trampoline facilities rather than organized gyms. Bouncing off a trampoline can result in a fall of 3–4 metres (10–13 ft) from the peak of a bounce to the ground or a fall into the suspension springs and frame. There has been an increase in the number of home trampolines in recent years and a corresponding increase in the number of injuries reported. Some medical organizations have suggested that the devices be banned from home use. Authorities recommend that only one person should be allowed to jump at a time to avoid collisions and people being catapulted in an unexpected direction or higher than they expect. One of the most common sources of injury is when multiple users are bouncing on the trampoline at one time. More often than not, this situation leads to users bouncing into one another and thus becoming injured; many suffer broken bones as a result of landing badly after knocking into another user. Another of the most common sources of serious injury is an attempt to perform somersaults without proper training. In some cases, people land on their neck or head, which can cause paralysis or even death. In an infamous incident in the 1960s, pole-vaulting champion Brian Sternberg became paralyzed from the neck down in a trampoline accident. Danger can be reduced by burying the trampoline so the bed is closer to the surrounding surface to lessen falling distance, and padding that surrounding area. Pads over the spring and frame reduce the severity of impact injuries. Keeping the springs covered also reduces the risk of a limb falling between the gaps in the springs and the rest of the body falling off the trampoline. Kits are available for home trampolines that provide a retaining net around the trampoline and prevent users from bouncing over the edge. The American Academy of Pediatrics states that there is no epidemiological evidence that these improve safety. The nets do prevent jumpers falling off the trampoline onto the ground, but these falls are not the most common source of injury. Multiple users bouncing in a netted trampoline can still be injured. Safety net enclosures have a larger benefit for safeguarding solo trampolinists, so long as they avoid falling on their head or neck. Having some training in a gym may be beneficial in alerting people to possible hazards and provide techniques to avoid bad falls. Family-oriented commercial areas in North America, such as shopping centres, carnivals, and so on, often include closed inflatable trampolines (CITs) as a children's attraction. These have safety nets on the sides to prevent injuries. A mini-trampoline (also known as a rebounder, trampette, jogging trampoline, or exercise trampoline) is a type of trampoline less than 1 metre (3 ft 3 in) in diameter and about 30 centimetres (12 in) off the ground, often kept indoors and used as part of a physical fitness regime. So-called rebounding provides a form of exercise with a low impact on knees and joints. 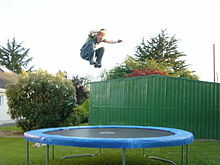 Mini-trampolines do not give a rebound as high as larger recreational or competitive trampolines. Most department and big-box stores sell mini-trampolines. Trampoline activity has been used by science teachers to illustrate Newton's Three Laws of Motion, as well as the "elastic collision." In co-operation with the University of Bremen and the German Aerospace Center (DLR), the machtWissen.de Corporation from Bremen, Germany developed the weightlessness demonstrator "Gravity Jumper" based on a trampoline. Due to the acceleration during the jump, an acceleration force takes effect in addition to the usual gravitational force. Both forces add up and the person on the trampoline seems to become heavier. As soon as the jumper leaves the trampoline, he is under a free fall condition, which means that the jumper seems weightless and does not feel the acceleration due to gravity. Every person receives a three-axis acceleration sensor, fastened to them with a belt. The sensor transmits the data of the flight path to a monitor; a monitor shows the course of the acceleration, including the weightless phase. The interplay of acceleration due to the trampoline and weightlessness becomes apparent. Emerging research on autism suggests that "trampoline jumping is one of the most therapeutic recreation activities for children on the spectrum,” according to Case Lawrence, one of the world's foremost trampoline experts. ^ "Sideshow World, Sideshow Performers from around the world". www.sideshowworld.com. Archived from the original on March 3, 2016. Retrieved May 3, 2018. ^ "Inventor of the Week Archive - George Nissen". Massachusetts Institute of Technology, MIT School of Engineering. March 2004. Archived from the original on June 30, 2007. Retrieved April 13, 2007. ^ Eskenazi, Gerald (May 3, 2018). "A Sportswriter's Life: From the Desk of a New York Times Reporter". University of Missouri Press. Retrieved May 3, 2018 – via Google Books. ^ "Trampoline history". Archived from the original on June 10, 2010. ^ News, A. B. C. (June 30, 2015). "Big Bounce in Trampoline Parks Puts Safety in Spotlight". ABC News. Archived from the original on December 26, 2017. Retrieved May 3, 2018. ^ Sarris, Tracy (April 1, 2014). "Indoor trampoline parks are 'springing' up everywhere!" (PDF). Association of Indoor Trampoline Parks. Archived from the original (PDF) on February 26, 2015. Retrieved March 28, 2017. ^ Sarris, Tracy (April 1, 2015). "Jump! Spin! Fly! Indoor trampoline parks continue to be one of the fastest growing indoor entertainment attractions worldwide" (PDF). International Association of Trampoline Parks. Archived from the original (PDF) on March 29, 2017. Retrieved March 28, 2017. ^ Page, Bubba (June 2, 2016). "Want to Snag Millennials on a Budget? Create Selfie-Worthy Experiences". Inc. Retrieved August 27, 2016. ^ Park, Clayton (October 20, 2015). "Battle between dueling trampoline parks shaping up in Daytona". The Daytona Beach News-Journal. Retrieved August 27, 2016. ^ "CircusTrix Pounces on Operator of Indoor Trampoline Parks". Wall Street Journal. February 1, 2018. Retrieved February 9, 2018. ^ Miracle, Veronica (August 25, 2016). "New Clovis location for Skywalk Extreme Sports Arena will house largest America Ninja Warrior course". KFSN-TV. Retrieved August 27, 2016. ^ "Maureen Kerley Pushes for Trampoline-Park Regulations Following 2012 Death of Son at Phoenix's SkyPark". Phoenix New Times. June 5, 2013. Archived from the original on August 11, 2016. Retrieved June 15, 2016. ^ "Death at B.C. trampoline park prompts call for safety regulations". ctvnews.ca. January 26, 2018. Archived from the original on April 6, 2018. Retrieved May 3, 2018. ^ "Trampolines" (PDF). U.S. Consumer Product Safety Commission. September 2000. Archived (PDF) from the original on January 26, 2017. Retrieved February 6, 2017. ^ "Study Of Trampoline-Related Injuries Calls For Ban On Devices". sciencedaily.com. Archived from the original on September 24, 2015. Retrieved May 3, 2018. ^ a b c d Fitness, Council on Sports Medicine And (October 1, 2012). "Trampoline Safety in Childhood and Adolescence". Pediatrics. 130 (4): 774–779. doi:10.1542/peds.2012-2082. PMID 23008455. Archived from the original on May 3, 2018. Retrieved May 3, 2018 – via pediatrics.aappublications.org. ^ Connolly, Sean (October 2016). The Book of Wildly Spectacular Sports Science. 225 Varick Street, New York, NY 10014-4381: Workman Publishing Co., Inc. p. 67. ISBN 978-0-7611-8928-2.